Travel medical insurance plans can be classified as either fixed/scheduled benefits or comprehensive plans. 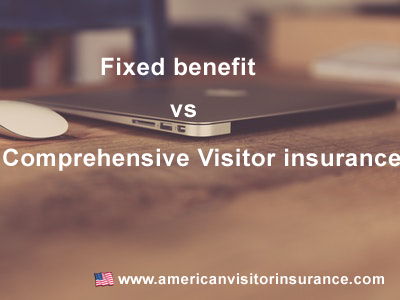 There are few factors to consider while buying visitors insurance. There are significant differences in the coverage, price, benefit limits... between the two types of plans. Listed here are details to highlight these differences. Fixed benefits plans have specific benefit limits for different covered medical expenses. These benefit limits are not the same as the plan medical maximum. Clearly defined coverage limits. More affordable when compared to comprehensive plans, but with correspondingly less coverage. This works for small ailments, but can be inadequate for major expenses. Cheapest options in the market definitely more affordable. How do fixed benefits plans work? The customer is required to pay an initial deductible for each injury or sickness and the plan pays for the rest of the covered expenses. You can visit any hospital or doctor, since there will be no discounted rates, the plan will only pay up to the clearly defined limits for different expenses. Any limitation on hospitals and doctors? No limitation, you can go to any doctor or hospital, however the plan will have clearly defined payments for different treatments. The plan pays for all expenses after the deductible and co-insurance component. These plans are recommended given the high costs of health care in the US. These plans are worth every penny of premium paid in the event of catastrophic medical emergencies. How do comprehensive plans work? The insured has to pay the deductible and an additional 20% co insurance for the first $5000 of the medical expense incurred. After $5000, the plan pays 100% of the eligible medical expenses up to the plan maximum. There are other variances of the co-insurance, some where the plan pays 90% up to first $5,000 and 100% after that. Most comprehensive plans have PPO networks, which means cashless service (direct billing as opposed to reimbursement basis), more discounted rates, as well as easier acceptance within the PPO network. It is recommended that you visit Doctors/Hospitals within the PPO network, even though you can go outside the network also. Within PPO network entitles you to discounted rates and direct billing. What is the cheapest travel insurance? After deductible, the plan covers set amount up to a maximum of $50,000. You must pay the first $100 (deductible). After that, the insurance company only pays the fixed amount for the policy, In this hypothetical case mentioned below in the table, the insured has to pay $15,900 because of the difference between the fixed amount the insurance pays and the actual billed amounts. Note that if you purchase a policy with a higher maximum, all the fixed amounts go up, so you can get better coverage of a medical bill. However, you may not get 100% coverage of ANY medical bill with a fixed plan. Deductible is $100 with maximum coverage of $50,000. Policy covers 80% of first $5000 then 100% to the policy limit. In this case your expense is the first $100 deductible followed by 20% of first $5000, which is $1000. Thus your final expense is $1100 while the insurance company will cover the remaining $22,900. Our Quote Comparison tool allows you to evaluate different plans based on deductible cost.